This ancient wig is unusual in two ways: it features dreadlocks and has a stunning gold ornament over it. 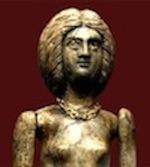 Most male and female Christians, even the ancient ones, followed the hair style fashions of the age and countries in which they lived. When the Beatles haircut was fashionable in the 1960’s, lots of American young men of all faiths had the floppy haircut that Ringo sported. When the Pixie cut was in, lots of girls and women got Pixie cuts. When long hair is fashionable, Christian women have long hair. When short hair is fashionable, they have short hair. Crew cuts were big for American boys in the late 40’s to early 60’s. They mimicked the military shorn-heads of their fathers, brothers and men who were returning from WW II. 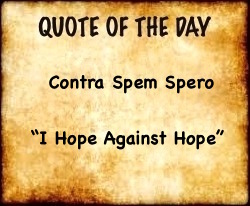 Everyone of all beliefs usually follows the mores and fashions of their time. 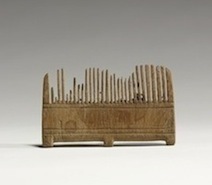 Egyptian comb, c. 1500 BC. The following are the hair styles that were popular in the Greco-Roman world in the first through the fourth centuries AD. 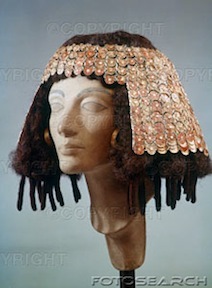 Of course, the wealthy could afford a hairdresser (or had slaves who did their hair)and could adorn their hair with more expensive clips, bands, hats and ornaments, but most ancient people wore their hair in some approximation of these hair styles. And women have forever had combs, brushes, wigs and even hair extensions. Here’s an Egyptian comb from c. 1500 BC. Hasn’t changed at all. 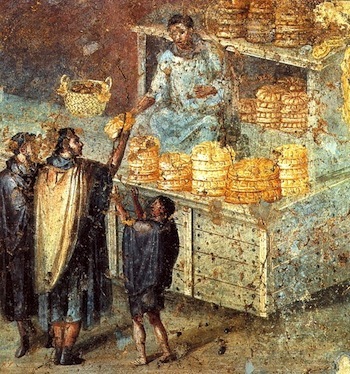 Christians in the first and early second century AD were mainly slaves, freedmen (slaves who had bought or someone else had bought their freedom), soldiers and shop keepers. 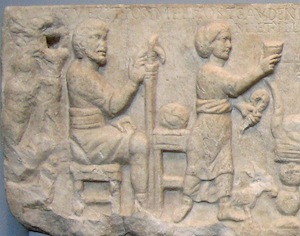 This funerary plaque (below) from c. 80 AD from the tomb of Claudia Prepontis, an ex-slave, and her husband is probably typical of the plain clothes and simple hairstyles of their class. 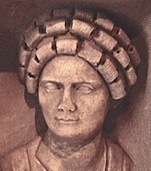 The 16-year-old Cornelia Frontina’s funerary inscription indicates she was born a slave, ransomed and adopted by the Cornelia family. Adoption of slave children was common among Christians. The Cornelias were not a wealthy family, but they loved their adopted daughter enough to give her a worthy monument. Notice the leather ball and her dog in the sculpture. Her hairstyle and that of her father are simple and neat. We have written about the encaustic style of funeral masks in this blog (Christ As Pantocrator under ART). 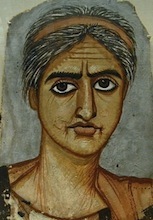 This encaustic mummy portrait is from c. 300 AD. The older woman probably belonged to a lower class because of the absence of any jewelry or fine clothing. Her salt and pepper hair has been simply pulled back and she appears to be wearing a leather head band. By the middle of the second century, Christianity had rapidly spread from slaves to masters, from friend to friend, from evangelists to citizens, from town to town until there was quite a large amount of people in all classes in the Roman Empire who were Christians. Wealthy and upper middle class Christians dressed better, ate better, had bigger homes and could afford more elaborate hairstyles. Here are examples of how they probably dressed and fashioned their hair. 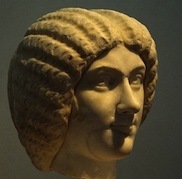 This woman in the second century reflects the middle-parted, rings of curls plastered to the sides of cheeks hairstyle of the well-to-do women in the Empire during the Antonine dynasty of rulers. Julia Domna (170-217 AD) was the wife of Emperor Septimus Severus (reigned 193-211) and the mother of Emperors Geta and Caracalla. She was famous for her intellect and political savvy. As can be seen, her hairstyle is an elaborate folding of thick curls, pulled down, drawn back and held in place in the back of her head by 3-4 horizontal thick layers of soft waves. Or, it could have been a wig that reflected the style. Apparently her hairstyle was considered very chic because they made a doll for little girls featuring her image and hairstyle. 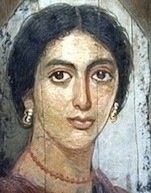 This is one of the Fayum Egyptian mummy encaustic portraits from the late 1st century AD. She has a serene, elegant look and adorns herself with a purple robe, a white gauze veil, large gold earrings, and what seems to be a coral necklace. Her hair is neatly parted in the middle and taken back, probably into a bun. Most of the Fayum mummies were from the merchant or patrician class. 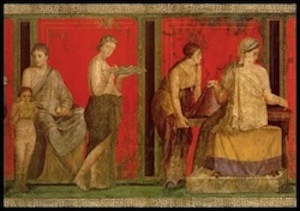 This fresco from Pompeii is interesting because the five females are of one household.The short-haired child is on the left. Her mother and the woman next to her both have light hair, very unusual in Roman paintings, and they are dressed in regular slave’s clothing. The middle woman with the green cloth wrapped around her waist appears pregnant. The two women on the right, one with her hair pulled back in a long pony tail and the other with her locks turbaned with a silk wrap, seem to be by their elegant robes the mistresses of the home and the other three are house slaves, possibly from Germany. The woman in this Pompeii fresco is obviously wondering about what she is going to write in her book (codex). She is probably from one of the upper classes in the doomed city and wants to be painted as literate and intelligent. Her hair style is simple–short curls beneath a lovely gold-adorned cap. 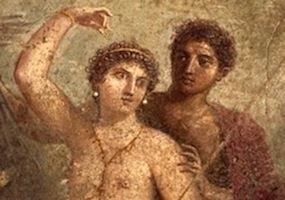 This wall painting is a very famous one: the young couple from Pompeii. 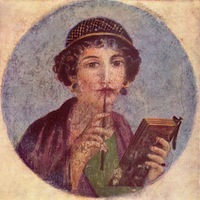 She is about to write something with her pen (stylus) in her gold-trimmed codex which indicates she is literate and well-bred. Her hair is parted in the middle, pulled back and there are snippets of curls around her forehead and her neck. Her husband is darker-skinned than she and has a “widow’s peak” and very short hair. He holds a papyrus scroll in his right hand, indicating he, too, is literate and a business man. 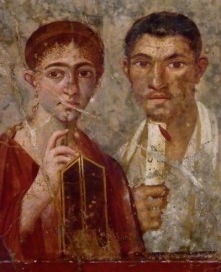 The woman’s pensive pose with stylus to mouth must have been a fashionable one in Pompeii for a certain class of people in the first century AD. This is a mosaic of Alexander the Great from the House of the Faun in Pompeii. 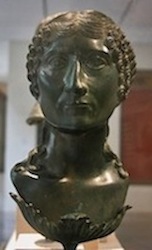 Legend has it that Alexander was sandy-haired, but this Alexander is a Roman soldier with shortish, ruffled black hair as if he is in a hurry. Legend, also, says that when Alexander was told the priestess at Delphi was not receiving any more visitors and he should come back another time, he burst in the door, grabbed the priestess by the hair at which time she yelled, “You are invincible!” Alexander rushed out and told his generals that the oracle had said he could not be defeated–and he left the premises–to conquer the world. This first century fresco from the House of the Faun in Pompeii depicts the myth of the Greek hero Theseus who slew Minos’ minotaur in Crete. The slain minotaur is to his left. 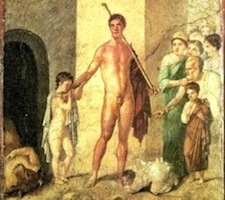 Theseus has short, curly hair as does the young boy to his right. The grandfatherly gray-haired man to his left has short hair and a beard.